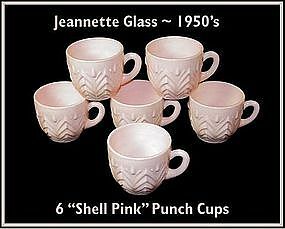 These Shell Pink Punch Cups were made by The Jeannette Glass Co. in the 1950's...All in excellent condition! SOLD! - Thank You! ~ photo shows darker blue than in real life. 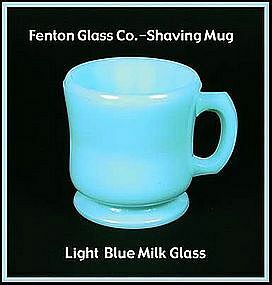 This 1930's Fenton blue milk glass shaving mug is lighter in color than the photo shows. There are 3 pointed soap holders on the inside of the mug. 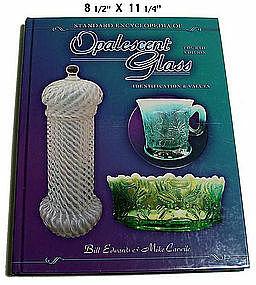 It is embossed E.M. C. on the outside bottom, and is in excellent condition! 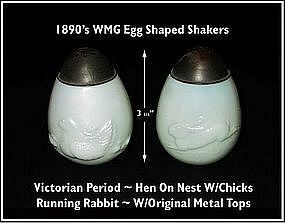 Very early Fenton piece.